Comfort Food: Mexican Lasagna $6.27 Entrée served with a side and a 22 ounce fountain beverage, or a second side. Great American Grill: Cajun Grilled Chicken Salad Sandwich $6.27 Entree served with a side and a 22 ounce fountain beverage, or a second side. Comfort Food: Sweet Italian Sausage with Polenta $6.27 Entree served with a side and a 22 ounce fountain beverage, or a second side. Great American Grill: Gouda Grilled Cheese with Roasted Onions & Mushrooms $6.27 Entree served with a side and a 22 ounce fountain beverage, or a second side. Comfort Food: Pork Chops Florentine $6.27 Entree served with a side and a 22 ounce fountain beverage, or a second side. Great American Grill: Turkey Pesto Panini $6.27 Entree served with a side and a 22 ounce fountain beverage, or a second side. Comfort Food: Grilled Veggie Kabobs with Rainbow Orzo $6.27 Entree served with a side and a 22 ounce fountain beverage, or a second side. Great American Grill: Southern Fried Catfish Tacos $6.27 . Entree served with a side and a 22 ounce fountain beverage, or a second side. Great American Burgers: The Casanova Burger with Ham, Swiss, and Mushrooms 6.27 Entree served with a side and a 22 ounce fountain beverage, or a second side. 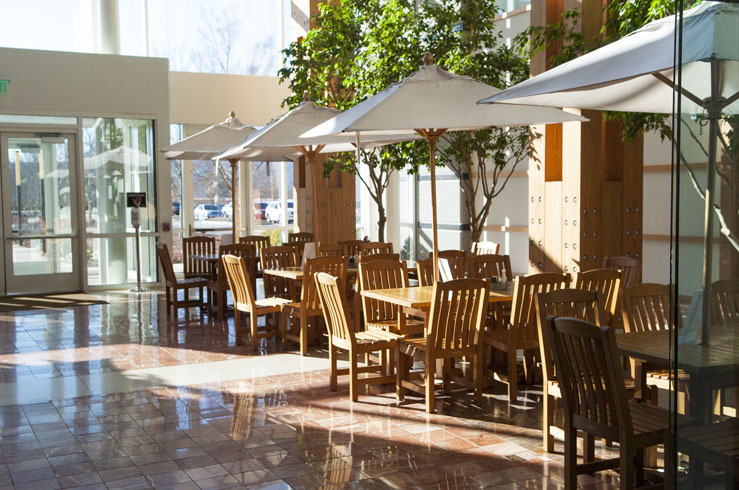 The Anita Loya Café is open to the public and offers a wide variety of healthy dining choices. Daily specials, pick-up-and-go, and cooked-to-order selections are available. A fully appointed salad bar is provided daily. Plus, we have Starbucks coffee. Diners should access the café through the west entrance of the Institute. 7 a.m. to 9:30 a.m.
1:30 p.m. to 2 p.m.